The guys who showed me around were worried that if their faces were shown they could be evicted for whistle blowing. MAHAD Egal, Jamie Murray and their two young children, who survived the Grenfell Tower fire, like so many others have still not been permanently re-housed by the council, and not only have they spent the last two years in temporary accommodation they now face eviction! Kensington and Chelsea Council claim that the temporary accommodation they are living in is ‘no longer suitable’ and have demanded that the family is moved – not into a permanent home but into yet more temporary accommodation. The couple had previously been offered a permanent home but it had aluminium casing round the windows. Understandably Egal and Murray refused it, as it was Aluminium Composite Material (ACM) cladding which was responsible for the rapid spread of the fire up the side of Grenfell Tower, a fire that claimed the lives of 72 men, women and children. She added that the stress of their present situation had caused her to experience vomit-inducing anxiety and made her flashbacks worse. In the last two weeks she says she has also suffered a miscarriage. The family added that moving from one property to another with two children would be ‘stressful and unnecessary’ and Egal is reporting symptoms of post-traumatic stress disorder (PTSD). They said the next time they move, they want it to be their permanent ‘forever’ home. The couple say they are now effectively being evicted from their current temporary accommodation, and they fear going out in case they are not allowed back in. Egal said that ‘every day from now on is a potential eviction day’ and he fears the effect it will have on their children. Local Labour MP Emma Dent Coad said the council sees some Grenfell survivors as ‘troublesome’ and wants to ‘clear the decks’ before the second anniversary of the tragedy on 14 June. She said there is ‘no culture change’ at the council, and she can see no justification ‘at all’ for wanting to move the family from their temporary accommodation. HUNDREDS of school youth staged a strike [against] climate change in Parliament Square yesterday. Lana Daly came with friends from west London and said: ‘The government needs to implement a strategy that cares for the environment. They need to listen to the science. Britain: Activists demand HSBC bank stop funding war and global climate change: here. This German tweet is about the Berlin pro-climate strike yesterday. Grenfell justice activists brought traffic to a standstill today in a protest against the continuing presence of toxicity in the area around the tower that was devastated by fire two years ago. The preliminary findings of a study into the widespread presence of toxic substances in the area around the fire that destroyed Grenfell tower in London were published in the journal Chemosphere. However, the Stec study described how “huge concentrations” of potential carcinogens are present in the dust and soil around the tower, as well as in the burned debris that had fallen from it. Although a chemicals consultant, AECOM, has now been appointed to investigate the issue, not a single government-organised soil test has been carried out 21 months after the June 14, 2017, fire. The publication of Stec’s full study confirms her original warnings, detailing “significant environmental contamination”. The carcinogen benzene was found in concentrations 40 times greater than the guideline level for urban residential areas in soil samples taken 27 metres away from the tower, six months after the fire. Samples from 142 metres away still registered up to 30 times the guideline level. Both sites had higher concentrations than would be expected for commercial land around petrol refineries. Six carcinogenic polycyclic aromatic hydrocarbons (PAHs) were found within 140 metres of the tower, at levels up to 160 times greater than other urban areas. Soil sampled 27 metres away contained more than five times the guideline level of the most toxic PAH, benzo(a)pyrene, which can damage the lungs and the immune system and is related to increased risk of cancers. Soil and debris sampled within 50 metres of the tower contained phosphorus flame retardants that are potentially toxic to the nervous system. A balcony 160 metres away from the tower, sampled 17 months after the fire, contained traces of isocyanic acid, ethyl isocyanate and propyl isocyanate, potential causes of asthma, rashes, swelling and lung inflammation. The researchers conclude that the findings could not have occurred naturally and that they are inconsistent with surrounding areas. They make the point that any study would have been much more valuable if begun in the immediate aftermath of the fire. Her report is a vindication of the concerns expressed by the local community and a damning indictment of the authorities’ refusal to act. Kerdesan herself suffered a bloody cough soon after the fire that antibiotics couldn’t cure. Seventeen months later, after a Grenfell survivor raised her case in a public meeting, she finally received a hospital appointment. Asked about the role of the Conservative government and the [Conservative] Royal Borough of Kensington and Chelsea council, Kerdesan said, “In the morning after the fire, the entrance to my house was covered in debris. I had to clean it myself. … I filled up four bin bags. I rang the council to ask for help, and they said no, you have to contact the housing association. I rang my landlord, and they said no, you have to contact the council. Why couldn’t we get this service as an emergency matter? It was all left there for us to deal with. Three weeks after the fire, I got a knock on the door from someone who’d come to clear the debris! “I think they should screen everybody now. That’s the first thing they should do. But they want to hide the truth. Joe Delaney, a local resident who lived adjacent to Grenfell Tower and has a long record of fighting for safe and decent housing in the area, condemned the government’s efforts to avoid a serious investigation. “Professor Stec came into the area in December 2017 and took samples, she told them of her findings in February 2018 and they sat on it and did nothing. Then it leaked in October 2018, and we all trooped to the Hilton Hotel for a meeting where they said they were doing something. And now here we are in April, and still nothing’s been done. “Lisa James and her assistant Cecil Sinclair are the community engagement team of MHCLG. She has been brought in from the private sector, where she is a motivational speaker. He is someone who has been seconded internally, and he’s come from the Troubled Families Unit. Joe explained that AECOM was the only bidder for the consulting position, in a tender process that lasted less than 48 hours. Their tender document was completed and submitted by December 12, 2018, before any meetings were held with Joe or other residents, who were told nothing had been decided. AECOM worked with RBKC as recently as 2016, when environmental studies had to be carried out during the Kensington Academy Leisure Centre rebuilding project. “It’s the magician’s trick, pick a card any card, and somehow you end up with the one that he wants. And if you read through their document it’s all talk about ‘managing expectations’. “There are academic institutions around the country that could have done this work. Or internationally even, if you really wanted to avoid questions of impropriety. “When they appointed AECOM, what they were basically saying was, ‘Come on now, enough time has passed, we just need to get on with things, so there’s no point objecting to AECOM.’ In other words, we’ve wasted almost two years, so we might as well do something—even if that something is useless and not what you want at all. Now they can say about the chemicals, well this stuff could have come from anywhere, it’s years later. Celotex supplied the RS5000 insulation sandwiched between the equally dangerous aluminium panels that were clad to Grenfell during its refurbishment. When RS5000 burns it gives off toxic fumes that contain cyanide. Highly flammable insulation was combined with aluminium composite material (ACM) cladding with a highly flammable polyethylene core. “What PHE said was, yes there may be stuff in the area but Victorian people lit fires and had factories. Firstly, there weren’t factories. This area was a slum, bits of it were a racetrack owned by the Earl of Ladbroke, and farmland. We didn’t have chemical industries. If you look at the dispersal pattern for PAHs, the heaviest concentrations are around the tower and they seem to decrease the further away you go, so more likely than not they came from the tower. THE son of a jailed Bahraini opposition leader has resumed his vigil outside the country’s embassy in London after a six-month gap. Ali Mushaima returned to Belgrave Square today where he previously spent 46 days on hunger strike. He re-erected a banner of his father, 71-year-old Hassan, who was sentenced to life imprisonment by a military court in 2011 during the Arab Spring. Mr Mushaima said: “I find myself having to come back to the embassy as the Bahrain government is deliberately denying my 71-year-old father his human rights, including medical care. Mr Mushaima is a cancer survivor who still suffers from diabetes, erratic blood pressure, prostate issues and an ear injury. The British government has paid to train Bahraini jailers in prison medical procedures, but the Mushaima family says healthcare at Jau prison is inadequate. Residents say the report confirms their fears about contamination following the fire in London, which killed 72 people. Analysis of soil, debris and char samples of insulation boards used on the tower has revealed heightened concentrations of cancer-causing chemicals and proven carcinogens including benzene within 200m (656ft) of the tower. Researchers from the University of Central Lancashire have recommended a long-term health screening process be put in place for residents and emergency responders who attended the fire, and called for a further independent analysis of the health impacts. CANCER-CAUSING chemicals and other potentially harmful toxins are present close to Grenfell Tower, according to analysis of debris and soil samples. Samples from six different locations within a mile of the west London tower, where 72 people were killed in the June 2017 fire, were analysed by researchers from the University of Central Lancashire (UCLan). Pieces of soil and fallen debris taken within 50 metres of the tower were shown to contain toxic phosphorous flame retardants that are used in insulation foam. Researchers also concluded that there was an “increased risk” of local residents developing cancer and asthma. Shadow fire minister Karen Lee said: “It is unacceptable that the surrounding community continue to suffer. “Toxicity tests should have been undertaken immediately after the fire, and appropriate health and safety measures put in place by the government instead of leaving residents at risk. This 21 March 2019 musical parody video from Britain is called The Wheatles – A May in the Life. It is a parody of the Beatles song A Day in the Life. ‘Wheatles’ is an allusion to British Conservative Prime Minister Theresa May answering the question of what was the naughtiest thing she had ever done with: I ran through wheat fields. You love her wacky antics, but what is it like to actually *be* Theresa May? Find out on The Wheatles’ epic new single “A May in the Life”, a descent into madness par Brexcellence. Officially, the demonstration was not against Brexit. Organisers said that pro-Brexit voters were also disgusted by the way Theresa May’s Conservative government mishandled Brexit. They might want another referendum and were welcome at the protest. However, suppose that in a second referendum, Leave would win again? That would be a gift to hardline Conservative politicians like Boris Johnson. And, suppose that in a second referendum, Remain would win with a small margin: would pro-Remain politicians like Tony Blair then be willing to have a third referendum? Or would they want a third referendum only if the second referendum would have been a Leave victory again? The record of the European Union in respecting referendum results is not that democratic. In 2005, the electorates of both France and the Netherlands voted, not on whether or not European Union membership, but on a draft European Union constitution. The draft, written by controversial right-wing French ex-President Giscard d’Estaing, made capitalism and militarism sacrosanct (eg, the constitution of the USA does neither). The referendum in the Netherlands had been called by establishment pro-European Union forces, who were very surprised when two thirds of the electorate voted otherwise. The European Union reacted to the referendum defeats by replacing the draft constitution with the Lisbon Treaty, with basically the same content. There was a referendum on the Lisbon Treaty only in Ireland, where it was mandatory. Irish voters voted No. Then, under the establishment’s slogan, ‘Keep them voting until they vote our way‘, there came another referendum about the same Lisbon treaty (changed microscopically). A majority then voted Yes, as the establishment desired. A third referendum never came. In 2016, there was a referendum for the second time ever in the Netherlands. Again, not on whether or not European Union membership. It was about the draft economic and military treaty between the European Union and the right-wing Ukrainian government. The referendum was the initiative of a committee which said they were neither pro- nor anti-treaty, they only wanted a people’s vote on it. Again, two-thirds of the Dutch electorate voted NO, to the anger of the government and the establishment. The government made sure the people’s vote did not have a practical effect. In 2018, the new right-wing Dutch government decided they had enough of defeats in referendums. They decided to abolish referendums. Just before that plan became law, they suffered a third defeat. Progressive university students had collected enough signatures for a referendum on plans to give secret services more power for Big Brother spying on all people. The referendum electorate said No to the Big Brother plan. But the government still made it law. “Of course, Europe is not perfect, but before we had a say. That is, the Conservative governments of Cameron and May had a say. Susana came to the demonstration with friends Bethany, Rachel and Pixie. “My parents are Portuguese. They have created a life here, they could be deported”, she said. Connor said, “The government is a shambles, we’re a worldwide laughing-stock now. The rest of the world can’t possibly contemplate how badly we’re dealing with the Brexit fallout. The rise of far-right ideology is making Islamophobia and racism more acceptable, he feared. … “It’s become global, it’s frightening. Unfortunately, they are using Islam and anti-immigration as a bogeyman. They are using fake stories to besmirch the good name of refugees. Theresa May’s Weezer tribute band respond to her deal losing a second vote. What’s with these MPs dissing my deal? To make them so disobedient? And what the hell is GATT? Brexit is favoured by the faction of the bourgeoise that sees Britain’s geostrategic interests best served by becoming a free-trading, deregulated powerhouse allied to the United States … . Earlier in the day, pseudo-left groups organised in the Another Europe is Possible campaign assembled in a sub-demonstration. They made a collective feint of opposition to the worst “excesses” of the EU—its imposition of poverty and misery on millions by inflicting savage austerity measures and the murder of thousands of refugees by transforming the continent into a “Fortress Europe”. But all this amounted to was the amorphous slogan, “Remain and Transform”. Nowhere did they explain what the capitalist EU and its Fortress Europe was to be transformed into and by whom. 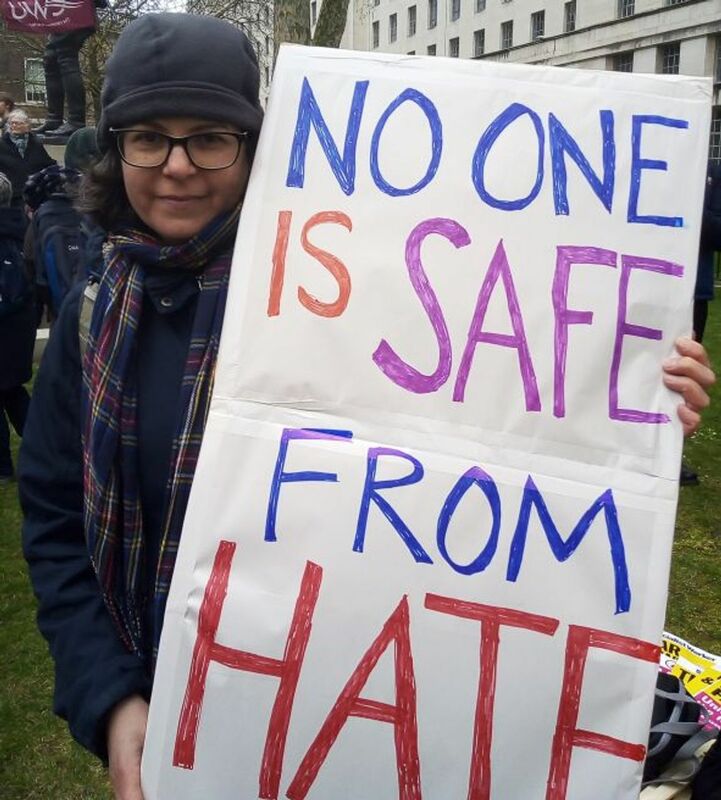 For the UN Anti-Racism Day against racism, Islamophobia, antisemitism and fascism, Stand Up To Racism group stopped at the New Zealand High Commission to send thoughts to those affected by the mosque shooting in Christchurch before marching between Hyde Park and Whitehall. 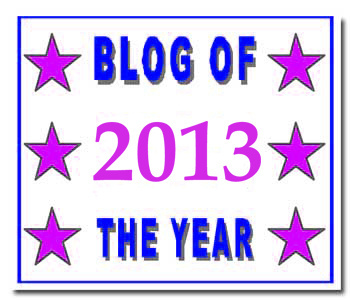 Report by Habiba Khanom. “There is a direct connection between the rise of the far right, of racism and fascism, and the rise of inequality in this country, in Europe and across the world”, he said. 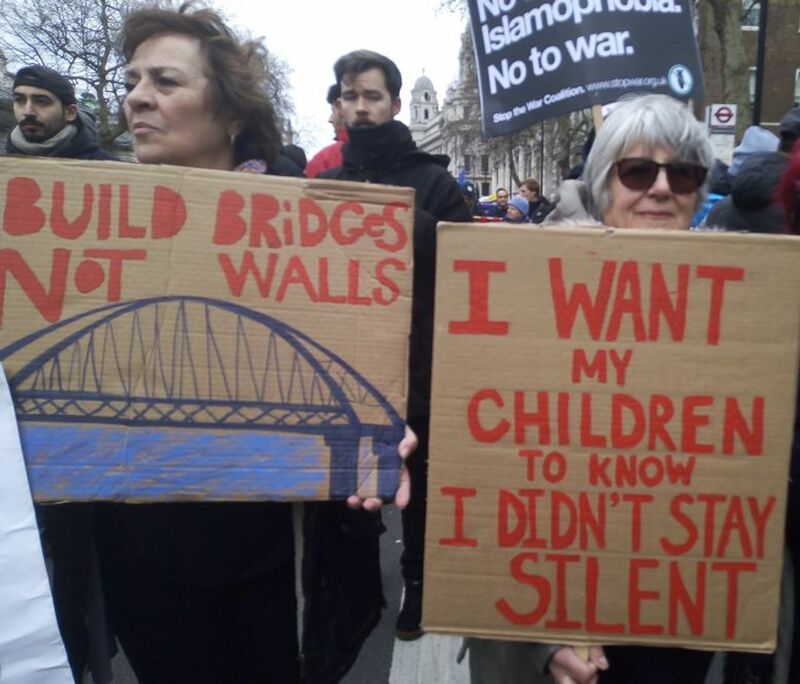 WSWS reporters spoke to some of those attending Saturday’s demonstration in London to mark the United Nations’ Anti-Racism Day. The march was held just hours after fascist terrorists murdered 50 people at two mosques in the New Zealand city of Christchurch. Asked what she thought about the events in New Zealand, Stella said, “We are horrified, and we are upset and we need to stop Islamophobia, which is ripe in the Conservative Party. [Leading Conservative politician and former foreign secretary] Boris Johnson turned around and described Muslim women as letterboxes. How can you not tear people apart and have division when you have that type of person? A WSWS reporter explained that the crisis-ridden capitalist system globally was fuelling nationalism and the growth of far-right forces. Ann said, “I agree that capitalism is at the heart of it. “The Western world [politicians] have done everything to place austerity measures at the door of the working class, which is the vast majority of the population. To bring austerity to bear to try to break our spirits—that is exactly what they have done. The division that exists between the very well off and those that have nothing is becoming wider and wider. That is why governments now are becoming terrified. They are scared that the spirit of the working class is coming together, and we will not be silenced. A WSWS reporter explained that there was a wave of historical falsification in German universities that has paved the way for the emergence of neo-fascist forces. Professor Jörg Baberowski at Humboldt University had played a critical role in this. The far-right Alternative for Germany was now the main opposition party in the Germany parliament. David is a history student at York University and has taught English in Turkey. 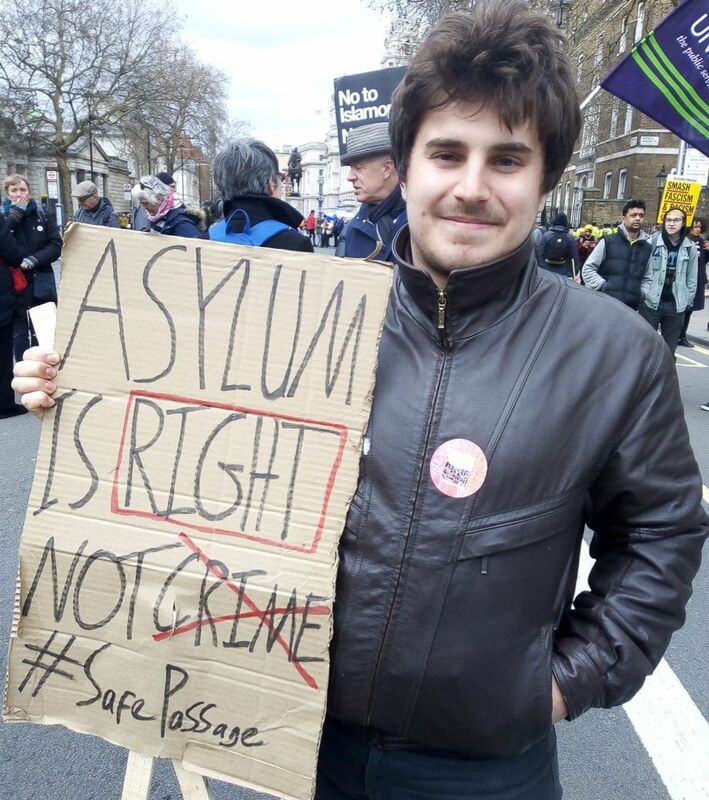 He said, “I’m here today to stand up against the rise of racism and the criminalisation of refugees, asylum seekers and against the European Union’s governments’ appalling policies. I oppose the Home Office [in the UK] and the bureaucratic obstacles put in place, again and again, to stop people accessing their rights. He said, “In the UK it’s normal to have restricted entrance into the country. Until 1962, there was no restricted entrance into the UK from the whole of the Commonwealth. We had complete freedom of movement. And then only 11 years later we enter the European community and the borders were closed. “We have a tradition in this country of open borders, so anyone from anywhere can come and contribute.” Asked what he thought the reasons for this were, he said, “It’s been stopped by the rise of racism and the criminalisation of refugees, the rise of fascism, and blaming problems on them instead of on the inherent inequality in the system and austerity policies. USA: Trump implored Fox News to “bring back” host Jeanine Pirro after her show was omitted from the Saturday night lineup following her Islamophobic remarks about the hijab worn by Muslim lawmaker Rep. Ilhan Omar (D-Minn.).